The Vietnamese Communist Party remains firmly in power, despite rising public discontent over the lack of personal freedom, government corruption and land seizures by the administration. However, within the party there seems to be an on-going struggle between hardliners and officials more inclined to economic reform. This political division has dampened reform efforts and diminished policy effectiveness in the past. The internal struggle over the future policy direction is about to intensify further before the next National Party Congress due in early 2016, when a new party leadership is expected to be chosen. Externally, the territorial dispute with China over conflicting claims in the South China Sea escalated in May 2014, when China deployed a drilling rig in waters claimed by Vietnam. This led to confrontation between rival vessels and violent anti-Chinese protests in Vietnam. After the removal of the oil rig in July 2014, both sides began talks to de-escalate the situation and finally agreed to use an existing border dispute mechanism to find a solution to the territorial dispute. However, it is unlikely that this conflict will be resolved anytime soon. Nevertheless, Vietnam has taken steps to further diversify its trading options by joining the US-led Trans-Pacific Partnership (TPP) and by recently reaching an agreement on a free trade deal with the European Union. Should the TPP be ratified by the participating countries, Vietnam’s medium-term growth prospects are expected to increase significantly. Vietnam is slowly moving from a centralised communist economy to a system of market-socialism. The economy is extremely export-driven, specialising in computers, electronics, textiles and footwear. 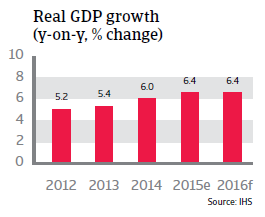 Economic reform (given the name ‘doi moi’ when initiated in 1986) has resulted in relatively high economic growth. While the business environment is slowly improving, it continues to be hampered by weak institutions and endemic corruption. The level of state intervention remains high, and many of the state-owned enterprises (SOE) are inefficient. 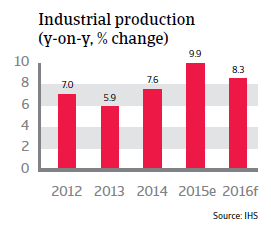 Since 2000 the Vietnamese economy has recorded relatively high growth rates of 6.5% on average, and this robust growth is expected to continue in 2016, with continued high increases in export and industrial production. However, foreign-owned businesses accounted for about 70% of Vietnam´s exports in 2015, which makes the economy vulnerable to a slowdown should foreign companies withdraw their operations (e.g. in search of cheaper labour). 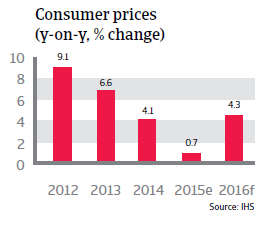 The persistently high inflation seen over the last couple of years (with double-digit rates in 2010 and 2011) has, since 2013, finally decreased, enabling the central bank to repeatedly lower the benchmark interest rate to the current rate of 6.5%. In 2015 consumer prices are expected to increase by only 0.7%. Vietnam´s public debt has sharply increased in recent years, to 53% of GDP in 2014, as a result of lax fiscal discipline, expenditure on infrastructure and social welfare and decreasing revenues (as corporate taxes have been cut). Public debt is expected to stabilise in 2015 and 2016. 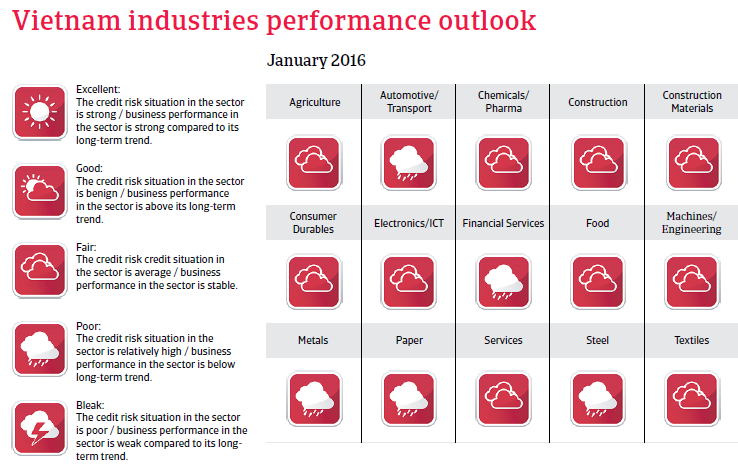 Reforms of inefficient state-owned enterprises and the financial sector are essential. Other structural challenges are improvements to infrastructure, workforce education and the fight against corruption. The banking sector, which is dominated by five large state-owned commercial banks, is in a difficult state. The sector suffers from low transparency, weak capitalisation, state intervention and a high rate of non-performing loans (estimated at 10% to 15%) due mainly to politically motivated lending. The government has taken some steps to clean up the banks’ balance sheets, e.g. by setting up the Vietnam Asset Management Company in order to help recapitalise banks. At the same time, it encourages M&A activity between stronger and weaker banks, but with limited success so far. So far, the banking restructuring efforts have left many Vietnamese businesses with limited access to capital, making it harder for them to compete internationally. While a comprehensive restructuring of the banking sector still seems remote, any collapse is unlikely as the government would step in to rescue state-owned banks. However, in combination with the high public debt such a bailout could pose a major strain on public finances. 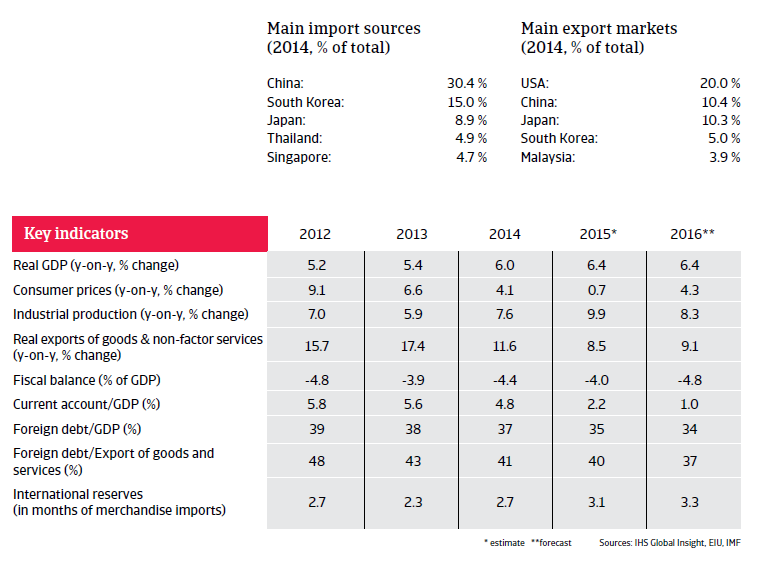 Vietnam has had a strong balance of payments, with solid current account surpluses since 2012. Inflows of foreign direct investment (FDI) are also high. 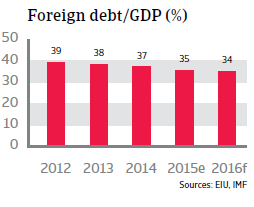 Foreign debt decreased to 35% of GDP and only 40% of exports in 2015. More than 80% of external debt is long term. Foreign exchange reserves are increasingly sustained by positive current accounts and are more than sufficient to cover the external financing requirements, but with just about three months the import cover remains poor, and liquidity shortages cannot be ruled out. However, given Vietnam´s limited international financial integration, sharp exchange rate devaluations are unlikely. While the exchange rate remains pegged to the USD, some moderate devaluations are likely. The exchange rate is strictly managed through a crawled peg system, and recently there have been small devaluations to maintain international competitiveness.